Does your baby hate tummy time? Did you know that getting the right toys can make tummy time more fun and easier for your baby? your little one needs some persuasion to be left on his cute belly. If so, you are not alone. Most babies don’t start out liking tummy time. Why not? Because it’s hard work! But that’s exactly why you need to persevere and try to help your baby to like it. Experts including the American Academy of Pediatrics all agree that tummy time is important for babies. In fact, there are benefits in encouraging your baby to start tummy time from birth and to continue tummy time up to 12 months old! Helps your baby to lift, support and control his own head. Teaches baby to turn his head to open his airways. Teaches your baby to master weight-shifting of body, hands and arms and improve balance and coordination. Prevents your baby from developing a flat spot on the back of his or her head as most babies spend a majority of their time on their back. By preventing the risk of a flat spot, you also minimize the risk of parts of your baby’s brain not developing properly where the flat spot is. Reduces the risk of Torticollis which restricts your baby’s head and neck movements. Promotes your baby’s tracking of objects that are close and far away and increase environmental awareness. Develops your baby’s abdominal muscles and postural strength for the next phases of sitting up, crawling and walking. Promotes motor control, planning and encourage sensory integration. Increases your baby’s sense of independence and confidence. It may surprise you but even though your newborn is pretty helpless after birth, you can start supervised tummy time immediately after you take him or her home with you. The keyword here is supervised. It is not safe to leave your newborn on tummy time, even for a minute. Even though your newborn may seem to be doing well on tummy time, he or she can still suddenly ‘face plant’ and may need your help to lift him or her up. So always keep a close watch until your baby is strong enough to lift his or her own head and turn his or her head side to side to take breaths of air. But start supervised tummy time as soon as you can. How Long Should Tummy Time Be? It all depends on how old your baby is and frankly, how long he or she is willing to stay on their tummy. 6-12 months Majority of waking time until the baby is mobile. Then, as much as you can to keep your baby on their belly! One of the worse mistakes that parents make is to let tummy time become torture time. No wonder some babies hate it. You cannot change the fact that tummy time is hard work for your baby. But you can make tummy time fun, light-hearted and a great opportunity to play. Choose a time when the baby is in his or her best mood (normally in the morning or after the baby is well-rested and fed). In the beginning, keep tummy time short. Don’t force your baby to stay in tummy time if the baby is full-blown crying. Instead, pick the baby up and try again later. You don’t want the baby to gain a negative association with tummy time. Use a small U-shaped pillow or something soft to give your baby an extra lift under his or her arms, especially in the beginning. 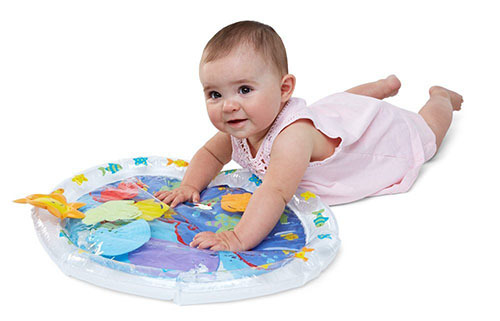 Use a fun play gym, mirror or baby play mat that your baby can look at. See suggestions below. Lie next to your baby and talk to him or her. Change your position from side to side of your baby and encourage baby to turn his or her head towards you. Give your baby reassuring pats and gentle massages on baby’s back while he or she is on tummy time. Let baby feel pampered during tummy time. Heap lots of attention! Place interesting toys in front of and next to your baby to encourage baby to look at them. Play with your baby! Wiggle toys in front of the baby, make eye contact and describe the toys baby is seeing. Use lots of enthusiasm when your baby is on his or her tummy. Cheer loudly, make encouraging sounds, let your baby know that you think he or she is a champion for staying on his or her tummy! Besides the traditional ‘belly on the floor’, you can also help your baby do tummy time by placing baby on your chest facing you while you are lying in bed or placing him across your legs in the burping position. Once the baby’s neck is strong enough to lift and support his or her own head, you can even do the airplane lift and ‘fly baby around’. All these counts towards tummy time as the baby is forced to lift his or head up. Here are some other ideas. So now that we have some ideas of how to do tummy time, let’s talk about some tummy time toys that will make tummy time a lot more fun, both for you and your baby! Play gyms are extremely useful for tummy time. Good ones incorporate a mat that has a variety of colors, textures and sounds that make it interesting for your baby to be on his or her belly. When your baby finally is able to lift his or her head, he or she will be thrilled to bat at and grasp at the dangling toys above. We firmly believe that play gyms are so valuable that you should not hesitate to get more than one. Why? So that you can place one in every room of the house that you intend to put your baby on tummy time in. It will save you having to carry the play gym from room to room and dropping toys in the process. Our test mummy has three different play gyms; one in the bedroom, living room and dining area so that she can easily place her baby down on tummy time in whatever room she needs to be in. On top of convenience, having multiple play gyms allows you to interchange and switch the toys around to continue to make tummy time interesting for your baby. When starting out with tummy time, you may want to choose a play gym that has a comfortable U-shaped pillow added in. We found that it was a lot easier to encourage our test baby to go for longer tummy times if we propped him up on the pillow. The pillow not only provides a more comfortable resting surface but also gives him a lift and better view of his surroundings. If you are searching for a play gym with a pillow, we recommend the Bright Starts Play Place. Not only is it colorful with bright contrasting colors but its design allows you to lift up the outer sides of the mat to form a protective wall around your baby. This protective wall may keep naughty siblings and pets out and provide a feeling of security for your baby but it also has colorful pictures on it. These pictures will encourage your baby to turn his or her neck to look at the pictures, which will further strengthen his or her neck. This tummy time toy also has a mirror, rattle, cute attachment toys with a variety of textures and motion-activated lights and music. All these things will help to develop your baby’s eyes, ears and touch. When your baby is able to start lifting his neck, he or she will enjoy reaching out for these toys. The music can also be set to play continuously for 20 minutes which will buy you some time to have a break or you can sing along! If you haven’t chosen a play gym yet, this one is a good choice! This Fisher-Price toy was on our recommendation list for the Best Toys for Newborns because we believe that it is one of the best on the market. Although this toy doesn’t have a pillow, it does have a wider variety of toys, including a musical toucan with dancing lights! This toucan can be disconnected and used as a toy on its own. There is also a soft detachable giraffe that comes with the play gym and a mirror. It is so much fun to watch your baby take his or her first look at the mirror and beam at the reflection. When they haven’t yet figured out that the other baby is them, it’s especially cute to watch. We also like that the mat has a variety of textures to develop your baby’s sense of touch. 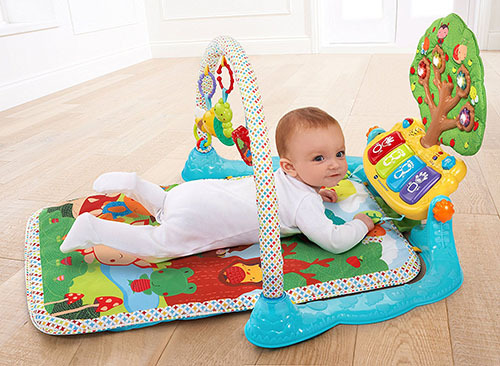 Just like the earlier play gym, this Fisher-Price-toy also has motion-activated music, sounds and lights that play when your baby kicks and moves. 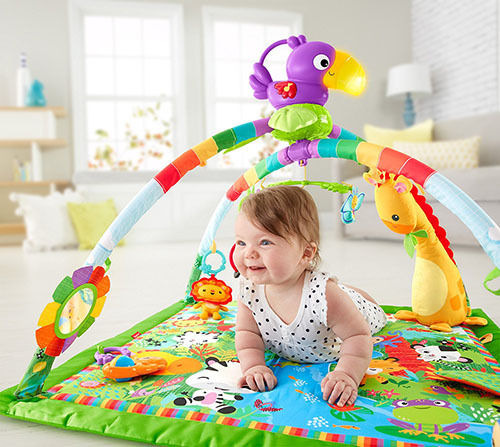 Your baby will look forward to tummy time with this play gym! 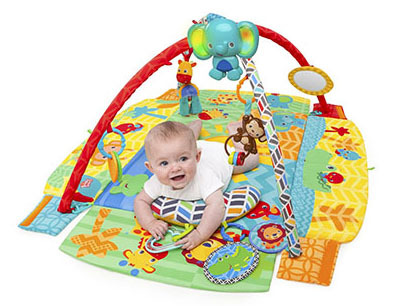 Like the earlier play gym, we love this one so much that we are recommending it again. Your baby may not be able to grasp toys properly but he or she will have no problems kicking! That’s why you will love this play gym so much. You may find yourself humming along as your baby starts tapping away on those keys. Don’t be shy, your baby loves to hear your voice and will appreciate it. The play gym also has dangling toys with different textures and one makes a crinkly sound too. There is a mirror that also goes on the bar. It is so engaging that most parents report that they can leave their babies on the mat for 30 minutes. This is valuable, valuable tummy time! The VTech Musical Glow Gym deserves a mention because it is slightly different from the other play gyms. With a colorful, picturesque tree that also doubles as an activity panel, it is guaranteed that your baby will try to lift his or her head to look at this interesting toy. The tree has cute little creatures on it as well as flashing lights. The panel beneath the tree is actually piano-like keys that play music including drum sounds when pressed. Attached to the panel are two leaves that your baby will probably enjoy clutching. There are 4 dangling toys with different textures and colors, including a mirror, teether and rattle. The mat itself is also colorful with a happy, forest-like atmosphere. All great news for stimulating your baby’s senses and getting your baby to love tummy time! Another very special play gym is the Skip Hop Arch Activity Gym which has a moving arch that you can adjust to suit your baby. On tummy time, you can lower the arch down so that your baby can play with the toys and stare at his or her face in the mirror easily. Once your baby is better at tummy time or wants to lie on his or her back, the arch can be moved back up to its highest position. The arch makes it versatile enough to keep your baby happy on tummy time, lying on baby’s back or while sitting up. There is also an engaging dancing fox that is sound-activated and an interesting pull-string owl that does peekaboo! It also comes with a hedgehog musical teether and a colorful mat with crinkly parts. Not only that but for all you tech crazy and millennial moms out there, there is a smartphone holder embedded in the arch so that you can record your baby’s facial expressions and movements! Now that’s not something you see in play gyms! We realize that although play gyms are amazing, they can be dear in the pocket and when you have a baby, your bills automatically go up. So here’s a recommendation for a simpler but still highly effective activity mat for tummy time that will be a lot nicer on your wallet. 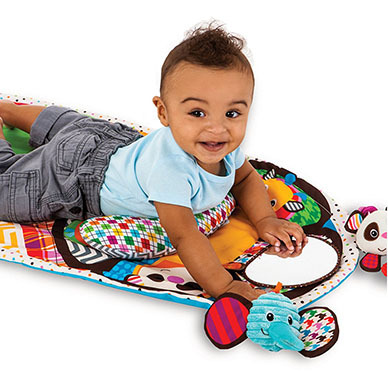 The Infantino Tummy time Mat was specifically created to help babies during tummy time. 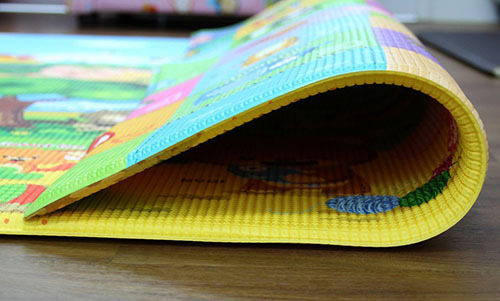 It is made up of a colorful mat and has a removable mirror embedded into the mat. It comes with a U-shaped pillow that is useful for propping baby up, especially during the initial stages when you are helping to ease your baby into tummy time. It has an attached monkey teether and crinkly elephant to provide different textures for your baby’s sense of touch. Simple and yet, it provides everything you need to get baby started off on tummy time successfully. Ok, so what if your baby is extremely fussy and hates all the play gyms that you have offered to him or her? Maybe your baby is a water baby! Some babies prefer the weightless feel of water and although you could invest in a pool, it won’t help your baby get more tummy time. Which is why we suggest that you get the Earlyears Play Mat. Fill it up with water and it creates a bouncy feel for your baby to do tummy time on. In addition, it comes with 6 animals inside the playmat (starfish, octopus, turtle, 2 fishes and sea horse) that move with the flow of water. Can you imagine how many minutes of fun it will provide for your baby especially if your baby likes playing catch? That will certainly add some valuable tummy time into baby’s day! Definitely a big thumbs up for tummy time! Play gyms are fantastic but they tend not to be very big in size, especially once your baby can start rolling over. If you want to invest in something that you can use over and over again, even when your baby is mobile or a toddler, we recommend the Baby Mat Gym. It is big enough for your child to play from baby to school age. The mat is reversible with different pictures on both sides so that you get great value for your money. One of the sides has pictures of ordinary things spelt with the letters of the alphabet so that you can use it as a teaching tool too. This mat comes in two sizes of medium or large. Other advantages with this mat are that it is non-toxic non-slip, waterproof and easy to clean. All good things! Besides the floor, baby can do tummy time in her crib or even on your bed, as long as you are supervising it or have secured the area so that the baby cannot fall off. Mirrors are a cheap but very effective way to make tummy time fun for your baby wherever baby is doing tummy time. Babies love looking at human faces, in fact, probably more than anything else. So a mirror is a great way to amuse your baby with very little necessary input from you. We like the Infantino Play Mirror because it comes with attachment straps and 2 rings that allow you not only to hang it up in your play gym but also to use it in a crib, stroller or car! As with any great activity mirror, it is colorful, has a variety of textures and comes with dangling toys too. In our opinion, great design and great value for money! This is one of the best tummy time toys on the list because it is one of the only few mirrors around that can grow with your baby. 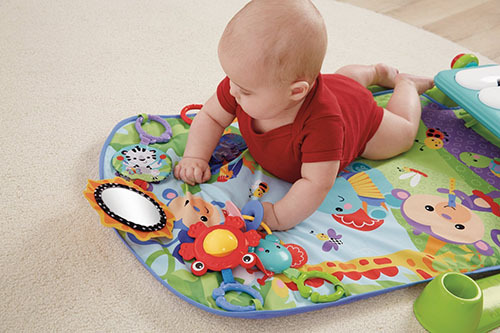 While your baby is doing tummy time, the mirror can be turned horizontally to give your baby a wider view. Once your baby starts sitting up, crawling or standing up, the mirror can be turned vertically to match your baby’s new height. Isn’t that cool? In addition, this mirror comes with piano buttons that play sounds and lights. 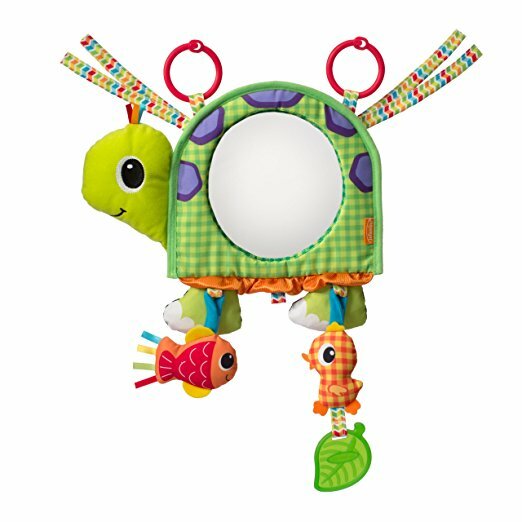 This mirror will not only make tummy time interesting but also keep your baby happy once he or she is mobile! There are so many other toys that we can recommend to help your baby enjoy tummy time but the above 10 are our top choices in providing a well-rounded and simple way for your baby to start tummy time immediately! Happy Tummy Times!